You’ve seen tiny houses on your favorite TV shows – now you can see them in person! In the Outdoor Village, you’ll have the chance to tour a wide variety of designs and structures including moveable tiny houses, bus conversions, van conversions, yurts, and park models. The Jamboree will also feature a DIY (do-it-yourself) Village where personal tiny homes, built by hand, will provide inspiration and a fresh perspective. The DIYers will even be on-hand to share their stories and insight! You can also explore products and services for your home and garden in categories including eco-friendly, solar, home improvement and smart home. While you’re at it, pick up some local Texas goods from our vendor fair area. The programming at the Jamboree is a huge weekend highlight. Attendees with common interests will gather together to listen to featured guests talk about their experiences and even answer your questions! Some panels teach you skills—like building with salvaged materials or cooking in a tiny kitchen. Others include screenings of documentaries and behind-the-scenes sneak peeks. Zack Giffin, Tiny Home Specialist and co-host of FYI’s TV Show, Tiny House Nation, will be completing work on a tiny house for a veteran in need during the Jamboree. You can immerse yourself in a day of woodworking with the guidance of Zack in this once in a lifetime opportunity. Looking for some family friendly activities? Then the Kids Zone, sponsored by DFW Child, is the place to be. Kids can participate in hands-on workshops, arts & crafts and more. Kids 12 & under also get in for free! Whether you’re a tiny house owner, enthusiast, or just curious about the movement, come jam with us and enjoy a weekend filled with fun, entertainment, workshops, education and more! 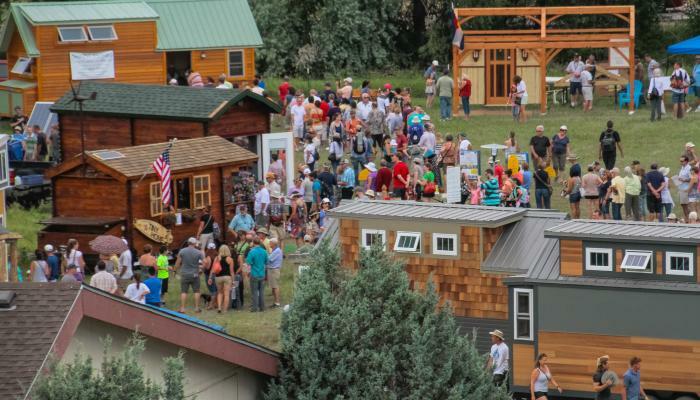 Note: Photo is from the Tiny House Jamboree in Colorado last year.